Candidates should go through the detailed eligibility criteria required to be fulfilled for admission to MDS courses of minimum 3 years duration. Only persons holding Indian Nationality or Persons of Indian Origin or persons holding cards of Overseas Citizenship of India will be considered for admission to this course. These candidates should possess a BDS degree of Dental College that is acknowledged by the Government of India under the Dentists Act, 1948. As for the acknowledgment of the Dental Colleges from where the candidates have completed their BDS degree and the corresponding Compulsory Rotating Internship for the year 2017, the cut-off date will be October 31, 2017. Colleges recognized after the cutoff date will not be taken into consideration. Certain Universities maintain the policy that candidates pursuing the PG course from their respective university or some other will be considered ineligible for admission, till the time they complete the whole course. Candidates pursuing any PG course through All India or State Quota and applying for a seat under All India Post Graduate Dental Entrance Exam should first verify facts regarding their eligibility of an University. Directorate, General Health Services cannot be held responsible in case such candidates are not given admission. If the students go for such college and course, it will be at their own risk. Candidates having cleared their final BDS examination on or before 1988 and holding a BDS degree from a Dental College duly acknowledged by the Dental Council of India are also exempted from the condition of Rotating Internship. These candidates should have got the interim or permanent registration through any State Dental Councils. Students who were admitted during 2006-07 session at Rajah Muthiah Dental College, Annamalai University under the 5 year BDS course excluding internship. In case a candidate is pursuing the 12 month Internship and is due to complete it by March 31, 2017, he or she can sit in this examination. NOTE: The admission procedure of such candidate shall remain restricted until he or she has successfully completed the training and attains the provisional or permanent registration prior to March 31, 2017. Or, presents a document stating that he or she will be completing the internship prior to March 31, 2017. The candidates should hold a provisional or permanent registration of any of the State Dental Councils, post clearing of the final BDS examination and also is done with the 12 months Compulsory Rotating Internship from an acknowledged Dental College. The registration procedure with State Dental Councils is mandatory. Also, the candidates will have to present the documents as proof at the time of counseling or admission. Army Dental Corps Officers serving at present, can only be admitted to the Institutions of the Armed Forces Medical Services. In the Application form, such candidates need to mark the option “Serving Armed Forces Dental Officer”. Army Hospital (Research & Referral), Delhi Cantt. The Directorate General of Dental Services shall be given a separate merit catalog of category “Armed Forces”, for admission into the Armed Forces Institutions. The Armed Forces Medical Services, on the basis of applications by Dental Officers for these institutions, shall make the selection and final admissions would be responsible for final selection to the above-mentioned institutions. NOTE: The Armed Forces Medical Services will have to adhere to the rules and regulations framed by the Ministry of Defence, Government of India in concurrence with those valid to the associated Universities. Those candidates who apply for grant of Short Service Commission in the Army Dental Corps’, shall mark the option “For Grant of SSC in Army Dental Corps” in the Online Application Form. The short-listing of candidates will be done on the basis of AIPGDEE 2018 scores and the Army Dental Corps will hold the selection process. 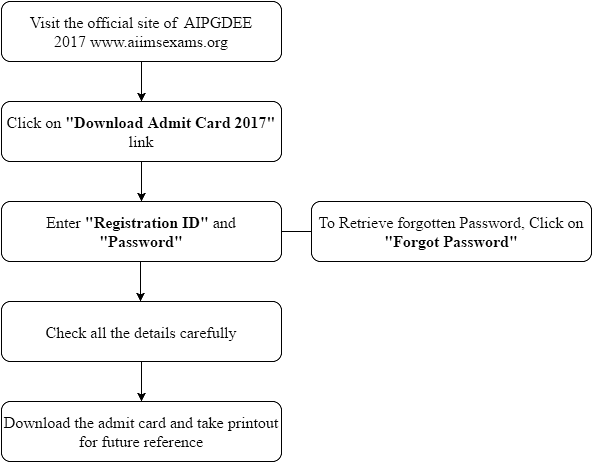 Candidates are advised to follow the steps below to download Hall Ticket for AIPGDEE 2017.